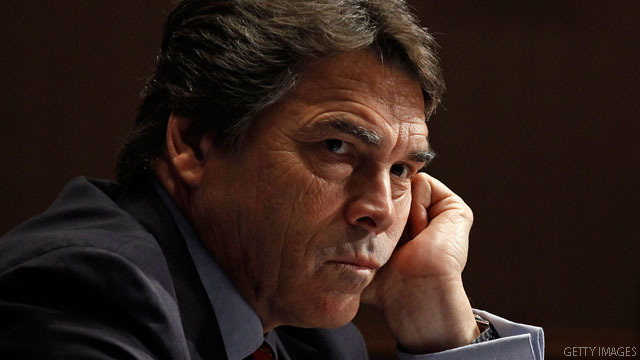 Big 'response' for Rick Perry? Washington (CNN) - It's likely not the response Rick Perry was expecting. Earlier this year, the Texas Governor called on Christians across the U.S. to come to Houston for a prayer event aimed at bringing God's help to a "nation in crisis." Organizers of the religious gathering, dubbed "The Response," say only 8,000 people have registered on-line to attend this Saturday's event at Houston's Reliant Stadium, a venue with a seating capacity of 71,000. Eric Bearse, a "Response" spokesman and former speech-writer for the potential GOP presidential candidate, says attendance numbers are a non-issue. "Not concerned whatsoever. We think it will be a powerful event whether it is 8,000 or 50,000. The only people concerned about numbers are press," Bearse said. Perry, who is still considering whether to run for president, is identified as the event's "initiator" on the "Response" web site. "We need God's help," Perry says in web video on the site's main page. The Texas governor goes on to call on Americans "to pray and fast like Jesus did." The event has come under steady criticism in recent weeks as controversial statements made by some of the gathering's organizers and pastoral "endorsers" have surfaced on-line. Bryan Fischer, a spokesman for one key "Response" organizer, the American Family Association, has referred to gay rights activists as "Nazis." At a news conference last month, Perry said it was unfair to tie him to comments made by some of the event's planners. Critics of "The Response" plan to hold their own gathering on Friday, one day before Perry's gathering. Sponsored by the Texas chapter of the American Civil Liberties Union and Americans United for the Separation of Church and State, the "Family, Faith, and Freedom" counter-rally will feature "a wide range of religious and non-religious groups from the Houston community," according to a statement from the groups. Both organizations accuse Perry of blurring the line separating church and state. "Government promotion of an exclusive Christian event implies that certain types of people care more about the well-being of our country than others… We don't see it that way" Terri Burke, executive director of the ACLU of Texas, said in the statement. Of course numbers matter, after all in reality this is a political rally for Perry. Please dear God, deliver us from another Texas gov. Make sure to keep those cameras panned low... and don't use the wide angle lens... pump in extra crowd noise... and of course, lie about the attendance (Glenn Beck can help you there).. and maybe your event will seem relevant.. Here is an idea Rick, since the Hunters Extravaganza is going on next door, and since most of those people probably voted for you, just go next door and offer them free cookies if they come next door to your event. I don't understand it all. Why would anyone not give up their Saturday to go sit in the blistering heat to hear a politician lie? I'm afraid we've already learned our lesson having god in the driver's seat in this country under GW. We don't need that again. God has already guven us his response, the clearest of road maps this nation will ever have. The Bible. Whether or not you "believe" that it is the word of God, its words are the product a very wise men. The Bible's overarching and fundamental message is a conversation about and a description of, man's narcissistic primitive impulses and what must be done to manage that narcissism. Isaiah 3:4 describes just how far that narcissism will eventually reach. It seems that God is going to make children our leaders. Children are the ultimate narcissists. When that happens neighbors will be fighting neigbhors. This "Response", if it follows the primitive impulsive tone of the "political-religious" right who are called "values voters" by their puppet masters (without any basis for calling them "values voters"), will allow no open, honest conversation about Bibical principles. It will allow instead most likely trumpet hate against those who do not look like them, do not live in their exclusive neighborhoods, do not drive their expensive cars, do not go to their exclusive schools, do not go to their church, do not belong to their exclusvie clubs, do not seek war but ask for peace, who understand the effect of the pagan influences in their religion, and who finally understand that their religion has been bought and paid for by politicians whose only interest in their religion is their vote. These people would crucify Jesus again if he dared to showup at this politically inspired rally. It must be nice being a liberal....quote the Bible without knowing it.....call everyone names without any consequence.....disagree with everyone who doesn't share your narrow view of the world.....sue others over any disagreement whatsoever.....all while preaching tolerance and open-mindedness. Liberal? No thanks.